The GKD Ball Injector, also known as a "Ball Gun" or a "Ball Sealer", originated in the late 1970’s in response to requests from some of the leading well stimulation companies in Western Canada. 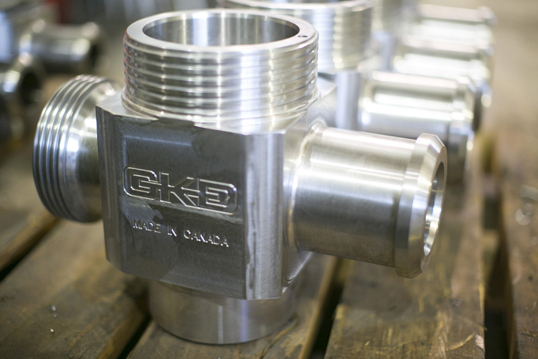 The GKD Ball Injector and its predecessors have been successfully deployed in oil fields around the world since the early 1980’s. The GKD Ball Injector is used to inject balls together with a pressurized acid solution (Fracture Acidizing or Matrix Acidizing) into the well. The balls are carried down to the perforations by the acid at the rate that the acid is being pumped. The balls follow the flow towards the open perforations until they seal against the open perforations, at which point the acid and an increased pressure is applied against the perforations that are not open or not fully open. This reaction opens more perforations to the acid and repairs well bore damage — Matrix Acidizing. 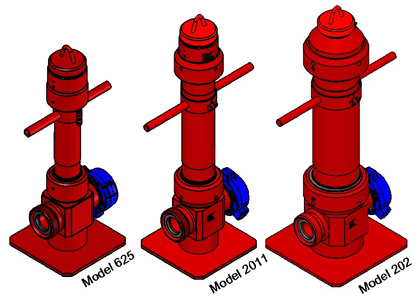 At higher pressures Fracture Acidizing is used to enlarge the effective wellbore. In both cases, the result is targeted fluid control, minimized fluid loss, reduced skin damage and improved flowback. Once the acidizing process is completed, the injected balls float to the top of the well if positively buoyant, sink to the bottom if negatively buoyant, or dissolve if biodegradable. Animation of the GKD Ball Injector with remote controlled motor drive, used for well stimulation in the oil industry. The balls can be injected by manually turning the Ball Injector’s vane shaft with the supplied hand crank, thereby releasing balls into the pressurized stream of acidic solution. However, because of the dangers involved in working with large volumes of high strength acid at high pressures, most service companies use the GKD Ball Injector with the remote controlled Motor Drive Package. Motor installed in an anodized aluminium housing with plated or stainless steel parts throughout for corrosion resistance – manual pressure equalizing valve enables pressure or vacuum relief if required.